Sleeve gastrectomy is a type of restrictive surgery that affects the integrity of the gastrointestinal tract amending its structure to evoke weight loss. The main goal of the surgery is to make the stomach smaller and in doing so limit food intake. Sleeve gastrectomy is a surgical procedure performed inside the abdominal cavity of the patient. There are two different ways to open up the abdominal cavity. First, and more common, is the minimally invasive laparoscopic technique – several small incisions are made to insert instruments and a camera to guide the procedure. The second way to enter the abdominal cavity is open surgery – the stomach is accessed through the vertical incision in the patient’s abdominal wall. During the procedure about 80% of the stomach is removed* leaving a narrow “sleeve” looking tube, hence the name of the procedure. Surgical staples or sutures are used to close the loose ends of the stomach.The procedure permanently reduces the size of the stomach and decreases food intake without rearranging the other parts of the digestive system leaving your intestines intact. After the surgery the stomach will be able to contain around 150ml of food, compared to the 500ml or more before the undergoing the procedure.This reduction provides a couple of mechanisms to reduce the weight of a person. First of all, the amount of food that can be eaten at one time is lessened, the stomach walls are stretched more readily and this quickens the feeling of satiety. Secondly, hunger is directly affected due to the reduced stomach area that produces ghrelin („hunger hormone“), a substance that activates the appetite centre in the brain and plays a role in how you feel and relieve hunger. These two mechanisms contribute to a weight loss. Who is a candidate for a sleeve gastrectomy? There are some requirements the patient has to meet before the surgery. The patient is suitable for the weight loss surgery when their efforts to reduce weight with dieting and exercise have been unsuccessful and the patient’s body mass index (BMI) is 40 or higher. However, this surgery may also be considered if the BMI is 35 or higher and a life-threatening or disabling problem related to excess weight, for example type 2 diabetes, sleep apnoea or high blood pressure is present. Also, there are some contraindications for this procedure, including comorbidities that markedly reduce one’s life expectancy and are unlikely to be improved with weight reduction, for example advanced cancer and severe cardiopulmonary, end-stage renal or hepatic disease. Furthermore, it is very important for the patient to understand the principles and nature of the procedure and to take up appropriate postoperative rehabilitation and change the lifestyle accordingly. Lack of compliance with these conditions may be considered as a contraindication for the procedure. After the sleeve gastrectomy most people lose 60-65% of their excess weight*. The level of success depends on how consistently the patient follows appropriate exercise and eating regime postoperatively. As with any procedure, potential risks and complications can arise. Overall complication rate – as well as the mortality rate – is low compared to other weight loss procedures. Most common complications associated with surgery are: infection of the incision and staple line leaks from the stomach into the abdominal cavity resulting in infection and bleeding. Even though rare and temporary, some gastrointestinal disturbances may still occur, such as aversion to food, nausea, vomiting and reflux. Also, some minerals and vitamins may not be well absorbed due to reduced stomach size. To sum up, the procedure has pros and some rare cons. *Please note that each case is individual and the results may vary. Obesity remains a serious health- and social-life related issue. Some cases are so severe that even a combination of the most drastic diet and vigorous exercises is futile. Consequently, weight loss (bariatric) surgery is becoming more and more popular and is sometimes the only way to attain health and harmony. Gastric sleeve is a bariatric surgery in which approximately 60-80% of your stomach is removed. Your stomach will look like a tube or sleeve after this surgery. The goal of gastric sleeve surgery is to decrease the capacity of the stomach in order to make you feel full after consuming small amounts of food. As a result, you will reduce your caloric intake and start losing weight. Directly following the surgery, you will wake up in a ward and have five to six small covered incisions in your abdomen region. Some discomfort, nausea, or pain is completely normal after such procedures. Pain killers will be administered through the intravenous catheter when necessary. Usually, patients are required to stay in the hospital for one or two days after gastric sleeve surgery. Generally, recovery time after the gastric sleeve procedure takes about two weeks, but it depends on the type of work you do. After this period of time, you will be able to return to your routine life activities. However, you should refrain from heavy lifting for about four to six weeks after the gastric sleeve procedure. Also, you will have to change your eating habits and stick to a special dietary plan. “Relearning“ to eat is necessary after the gastric sleeve procedure in order to let your stomach heal properly and to prevent complications (for example stretching of your newly formed stomach). Solid foods have to be introduced slowly and carefully in order to let your body adjust to the new anatomy of your stomach. Also, limiting food and even beverages right after the gastric sleeve procedure is required. Milk shakes and soda drinks have to be replaced with tap or distilled water, diluted juice, tea, and coffee. You will most likely be put on a liquid-only diet for the first one or two weeks after the surgery. The next step is a pureed diet that lasts about one or two weeks. After this you will be able to try solid foods. It is extremely important that you eat in very small portions and often, about five times per day. Nutrient-absorption issues are not as prevalent after the gastric sleeve procedure as compared to some other bariatric surgeries (for example gastric bypass). However, vitamin and mineral supplements are recommended after this procedure in order to provide your body with the necessary amount of these goodies. According to research, people achieve approximately 50-60% excess body weight loss at one year after gastric sleeve surgery. It is important to realise that the process of losing weight after the gastric sleeve procedure is gradual and requires an effort of will. A prescribed diet plan is one of the most crucial factors in the whole process of your weight loss. Moreover, physical activity is also very important. You should start exercising as soon as you feel no pain. Thirty minutes of walking per day within the first four weeks after your surgery would be a good start. One of the possible side effects that might follow gastric sleeve surgery is gastroesophageal reflux disease (GERD). It is a chronic disorder in which stomach acid flows back into the oesophagus (the gullet). Acid damages the inner wall of the oesophagus, which results in such symptoms as heartburn, chest pain, dry cough, sensation of a lump in the throat (globus pharyngeus), and others. It is thought that physiological and anatomical alterations in the stomach due to gastric sleeve surgery may provoke development of GERD. Some studies show that GERD may develop between the 3rd and the 6th postoperative year. The main factor determining whether or not GERD will develop is the shape of the newly formed stomach. The other possible risk is stretching of your new gastric pouch. Overeating, a lot of snacking, big portions, and other bad habits can overload your stomach and its stretch the walls. In order to prevent your new stomach from stretching, eat very slowly, chew thoroughly, avoid drinking during meals, and enjoy your food in small portions. A recent American study compared three bariatric laparoscopic procedures including gastric sleeve, gastric bypass, and adjustable gastric banding. The results revealed that patients undergoing the gastric sleeve procedure experienced less complications than those with gastric bypass. 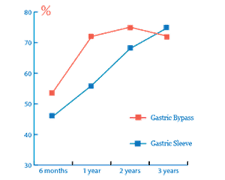 Furthermore, patients after gastric sleeve achieved more significant excessive weight loss at one year than patients after adjustable gastric banding. According to the results of the same study, the therapeutic effect on obesity-related diseases was very similar for all three methods. Gastric bypassand gastric sleeve are two bariatric surgeries that are performed if a person’s BMI is over 40 or above 35 and if a person suffers from serious health conditions such as hypertension, diabetes mellitus, infertilityand other. If a person suffers from diabetes type 2 mellitus then bariatric surgery can be performed if their BMI is over 30. Both methods are highly effective. However, the techniques, results and potential complications vary considerably. Both of these operations are performed laparoscopically. A few minor abdominal incisions are made and laparoscope (a narrow tube equipped with a camera and light) as well as other required instruments are entered to the abdominal cavity. During gastric bypass surgery the stomach is divided into two parts. A special pouch (stoma) is made in the upper and smaller parts of the stomach. A new pathway is created by cutting through the middle of the small intestine and connecting it to the small pouch formed in the stomach. This procedure makes a bypass of the lower part of the stomach (including pyloric part) and the upper part of the small intestine. The procedure shortens the digestive tract making a person lose a significant amount of weight. The surgery lasts one and a half hour and is performed under general anaesthesia. It usually takes from 2 to 3 months to fully recover. During the gastric sleeve procedure a surgeon removes three quarters of the stomach. As a result, the stomach takes a shape of a sleeve or tube. The gastrointestinal way remains unchanged. This allows proper absorption of all the consumed food. Gastric sleeve surgery may last up to 1 hour under general anaesthesia. Full recovery after the surgery takes around 2 months. Gastric bypass surgery is very popular because of its efficiency and quick results. Studies show that after gastric bypass people lose about 70 to 80 percent of excess body weight. Due to a decrease in nutrient intake a person starts to defecate more often, on average 3-4 times a day, preventing the body from putting on more pounds. In addition, the pouch formed during the operation is much smaller than the total stomach and this means the patient eats significantly less food. Gastric bypass is a long-term and effective weight-loss treatment. Although gastric bypass is generally considered as a permanent surgery, in rare cases it may be reversed, however restoration of the original integrity of the gastrointestinal tract is a complicated procedure. Gastric sleeve is also a common surgery. However, it does not produce such an effect as bypass and usually takes the second place in bariatric surgery. There are two main outcomes of this procedure: smaller capacity of the stomach and lower sense of hunger which is caused by removing part of the stomach responsible for production of the hunger hormone ghrelin. It helps a person lose 50-60 percent of the excess body weight. After gastric sleeve surgery the intestinal tract is not changed, digestion occurs naturally, all consumed food is well absorbed. Therefore, there is no risk of losing any nutrients such as iron or calcium. However, a certain diet is still recommended, though it is more flexible than the one recommended after gastric bypass. Although surgeons experienced in bariatric surgery can perform the procedures very quickly and easily, there is still a possibility of complications such as bleeding, infection, formation of thrombus which causes deep venous thrombosis or pulmonary embolization. The possible complication specific to gastric bypass is the Dumping Syndrome which causes diarrhea, vomiting and abdominal discomfort immediately after a meal. This may lead to the fear of eating in public places and other psychological and social problems. Moreover, after gastric bypass malabsorption may occur. It helps losing extra weight but it also interferes with absorption of important substances (calcium, vitamins, iron) which are essential for one’s body, so extra nutritional supplements should be taken. Because of gastric bypass characteristics this procedure cannot be performed on patients with ulcerative colitis, Crohn’s disease, anemia, or patients who have a very high level of obesity (BMI over 50 and more). The main disadvantage of gastric sleeve is irreversible. Moreover, there is a chance to regain the lost weight or to lose only a small amount of weight. After any gastric surgery a person has to carefully monitor what he or she eats for the rest of their life. Certain food limitations must be followed. For instance, patients will have to cut on high-fat and high-calorie food and sweets. Also the cereals, hard, dry and bulky products, nuts, hard peels of vegetables also should be avoided because of the difficulties related to digestion. People should chew the food well before swallowing, avoid sugary drinks (it causes the dumping syndrome), not to snack between meals, eat protein-rich foods and consume no more than 1,200 calories per day. These rules apply to all weight loss surgeries. The main difference between gastric sleeve and gastric bypass lifestyle wise is that gastric sleeve patients have to take less supplements than gastric bypass ones. During the first 6 months after gastric bypass about 60 percent of excess weight is lost. Over the next several years weight loss slowly decreases and finally the weight becomes stable. After gastric sleeve surgery weight loss is slower but constant. Obesity rates and the number of super-obese patients (BMI >50 kg/m2) has risen dramatically across the world. It is almost impossible to treat severe obesity using only diet andexercise. This has led to the search for surgical techniques which would provide adequate weight loss. Surgery is the only and most effective treatment of severe obesity that provides effective long lasting weight loss. Currently performed laparoscopic surgeries are modern, technically easier, and effective and are safer than ever before. Newer laparoscopic options for obesity treatment include laparoscopic sleeve gastrectomy, gastric bypass surgery, gastric banding and some others operations. All these options differ in complexity, reversibility, complications and extent of excess weight loss. The choice of procedure depends on a patient and a surgeon factors. Still, obese and super-obese patients are classified as high-risk patients because of complications and negative impact of obesity on their health. Overweight and obesity are associated with a higher risk of cardiovascular disease, increased incidence of heart attack, hypertension, dyslipidemia and type II diabetes. The impact on health care is overwhelming. If a patient agrees to have a surgery it is strongly recommended to apply surgical treatment in two stages. Sleeve gastrectomy as bariatric procedure was introduced as the first step operation in a two-step approach in high-risk or super-obese patients before performing a more complicated procedure such as the gastric bypass surgery. Sleeve gastrectomy is a relatively new operation with fewer surgical risks that are particularly suited to those patients at highest risk for surgery, either because of their medical co-morbidities or their weight. Studies show that the sleeve gastrectomy in the super-obese patients can be a definitive treatment for an average loss of excess weight by 50% in one year. After the first surgery step patients loose enough weight in order to perform second step – gastric bypass surgery. During this procedure a small stomach pouch is constructed bypassing a small segment of intestines. Despite all advantages of this procedure the surgeon and the patient should keep in mind that it is quite new technology and there is not as much long-term follow-up data as for other procedures. Sometimes when after sleeve gastrectomy in the long-run follow-up weight loss is insufficient, revision is needed. Also there is a possibility of complications such as severe symptoms of gastroesophageal reflux disease, strictures, fistulas, and malnutrition then revision is required. During the surgery gastric tube is formed, as a result the anti-reflux barrier between the stomach and the lower esophagus does not perform its function adequately. Sometimes even a high dosage therapy of proton pump inhibitor medications cannot relief the symptoms of reflux. Gastric bypass is considered to be the best option for revision procedure after sleeve gastrectomy surgery. Consequently gastric bypass revision surgery quickly solves these issues. Patient can stop medication immediately after revision and research shows that it has long-lasting effect. Due to recent quality improvement laparoscopic conversion from sleeve gastrectomy to gastric bypass has become technically more simple, more safe, and effective for re-inducing weight loss and for treatment of severe reflux after sleeve gastrectomy. a.Should you consider weight loss surgery? People who have tried all kinds of diets, enrolled in numerous “magical” weight loss programmes and have been working out at the gym like crazy but have not achieved the desired results see weight loss surgery as the last straw. It is an important step to take, and for some people it might even take up two years from the moment when a patient first starts to think about a weight loss surgery to the actual moment he or she decides to have it. Talk to relatives and friends, talk to doctors and hospital staff. Make an informed decision. The preparation for weight loss operation includes examinations and recommendations by medicine professionals such as a bariatric surgeon, an anaesthesiologist, a nutritionist and sometimes even a psychologist. This group works together to generate a treatment plan. Patients must be aware of the risks and benefits of weight loss operation. All in all, any procedure carries some risk and can lead to a great deal of worry. So prepare responsibly. You must be physically and mentally prepared. In addition, before the operation you have to lose some weight. Most of all, you must be aware of a change in your lifestyle and be willing to maintain your normal weight to guarantee a healthier life. Have you really tried to lose weight by dieting and sport? Are you psychologically prepared for the surgery and for the change in your lifestyle? Be ready to review your medical history with your surgeon. Inform your doctor about any anaesthesia complications that you or your relatives have had. For example, some patients can aspirate food or liquids into their lungs as a result of the inhibition of the natural throat reflexes that general anaesthesia can lead to. This is one of the reasons your doctor will ask you to avoid drinking and eating during a particular period of time before operation. Medication you are taking may interfere with weight loss surgery or with the medicine that your doctor will prescribe before and after your surgery. Be prepared to tell your doctor about any medications you are taking or planning to take during recovery. Herbs, minerals and vitamins may also interact with the medication, so tell your doctor about them as well. Here are a few examples of how surgery and surgery-related medicaments can interact with normal medication or food supplements: Aspirin, Coumadin, Plavix and vitamin E can enhance the risk of bleeding during operation. Estrogen hormone medicaments such as birth control pills may enhance the risk of blood clots. After operation, your stomach or the exit of your new stomach will be smaller. Medication can irritate your new stomach sack and lead to nausea or aches, so you may be asked to squash your pills for a few weeks. You should talk to your doctor about the tablets to squash and for how long. Some pills cannot be squashed because they are “sustained release” and must be replaced by a non-sustained release form pills. Follow your doctor’s instructions concerning your medication. Stop smoking for at least 30 days before weight loss surgery. Smoking may increase the lung sensitivity during the surgery and can cause pneumonia. Smoking may also slow down the healing progress by narrowing the blood vessels and thereby limiting the flow of the blood to the healing areas. Many surgeons will not perform surgery if there is evidence proving that the patient is a smoker and even go as far as asking for blood or urine examination for an evaluation of nicotine level before the operation. Lose some weight before the operation.Since the stomach lies under the liver, during the surgery the liver is lifted. If the liver is very oily, the operation may not even be carried out due to the liver cracking and bleeding. If the weight is reduced by 3 – 15 kg, depending on the excess weight, the size of liver goes down. Therefore the risk of complications due to liver bleeding decreases, while the possibility that the surgery will be performed successfully increases. Abstain from alcohol consumption for at least 48 hours before weight loss surgery. Follow your surgeon’s recommendation. Avoid drinking and eating before the operation. a.Why is it advised to arrange a few days off? A risk associated with surgery depends upon the procedure itself, the type of anaesthesia and the characteristics of the patient. The latter indicates stress, fatigue, unhealthy lifestyle habits and intentional refusal to take medications. All these factors may cause adverse effects. Since a patient requires rest and tranquillity to recover, a couple days off are essential after a bariatric surgery. Weight loss surgeries are performed under general anaesthesia. It means that you will be asleep through the entire procedure. Several hours in a recovery room and close monitoring later is highly recommended. It helps to ensure early detection of pathologies. The decision to take the patient to his/her ward is taken after the evaluation of the respiratory and circulatory functions, activity, consciousness and colour. The time spent at the hospital from this moment on depends on each individual case and the policy of a particular hospital. b.How long should you stay at the hospital? It is estimated that hospital stay after bariatric surgery ranges from 3 to 7 days. However, it depends individually on how each patient adapts to the changes brought by weight loss surgery, how the wounds are healing, the function of visceral organs which is reflected in the blood count test or urine sample, symptoms of inflammation and high fever, etc. Although the main decision is made by surgeon the patient should pursue a hospital stay of 3-4 days. The patient who pursues bariatric surgery should consider this and before assigning for a particular procedure get more information on the recovery period in hospital. It is his/her right to get an optimal treatment plan. Moreover, the procedures performed for obese patients, especially for those who have medical history of obesity comorbidities, carry a higher risk of complications than usual. c.When person is discharged from hospital? Usually, bariatric patients have problems adapting to diet changes. On the first 2 days they are not allowed to take anything from mouth.48th hour control x-ray with oral contrast is showing passage of the stomach and leak test at the same time. If the screening of the stomach is allright patient is allowed to take small drops of water every 5 minutes. d.Why is it not allowed to go home right after the surgery? Some patients seek early discharge. At this point it should be explained that there will be no medical equipment if something goes wrong and there is always a possibility of such a thing. Moreover, a patient might not feel a complication appearing in the early stage so it is more difficult to treat it going forward. Gastric sleeve surgery is a weight-loss procedure in which the stomach is reduced and formed into a tube-like shape. As the stomach becomes smaller, a patient requires smaller portion of food, therefore he consumes less calories and loses weight. As all other surgical procedures, gastric sleeve has advantages and disadvantages and must be carefully thought through. The main advantage of this procedure is that after gastric sleeve it is easier to feel satisfaction with smaller portions of food. This is due to two reasons. Firstly, as the surgeon reduces the stomach, the amount of hormones and other biochemicals involved in the sense of hunger also goes down. Secondly, some people feel satisfaction only after they have physically filled their stomach fully. After gastric sleeve the space necessary to be filled is remarkably smaller, therefore less food is required. All this allows consuming less calories and weight is lost. It is extremely effective if combined with physical exercise and a healthy diet. Significant loss of weight also leads to the improvement of blood pressure, diabetes, fatty liver disease and many other conditions. Gastric sleeve operation is less invasive than other bariatric operations (like gastric bypass) with no cutting, disconnection or alteration of small intestines. This reduces the risk of many surgical complications. Moreover, since the intestines as not altered, the absorption of minerals and vitamins is minimally affected and no dietary supplements are needed afterwards. This also means that gastric sleeve surgery has no associated dietary restrictions – the patient is able to eat everything that he or she used to enjoy before the operation. After gastric sleeve the outlet valve (the pyloris) of the stomach remains intact, different than after some other bariatric operations. There is no risk of the so-called “dumping syndrome”. With this syndrome the food passes through the stomach unaffected by gastric juice and causes indigestion, pain, diarrhea and other symptoms. No foreign artificial devices (such as a gastric band) are put inside the body. So there is nothing to slip, erode or cause infection. Using laparoscopy, this surgery can be performed even on extremely obese patients. Finally, if the gastric sleeve operation fails to reach the desired weight loss effect, then another surgery (gastric bypass or duodenal switch) can be performed. The greatest disadvantage of this procedure is that it is irreversible. A big part of the stomach is permanently removed and a new small pouch is formed. It is more sensitive to poorly chewed and quickly eaten food. To avoid vomiting and discomfort, some patients have to learn how to eat slower and more thoughtfully. Another problem is that some patients keep trying to eat the same amount of food that they used to, in spite of physical satisfaction. Since there is no device to stop from overfilling the new stomach it stretches. Because of constant overfilling, it enlarges and even more food can be consumed. This increases the calorie intake and a patient regains the weight that has been lost. The surgery does not limit liquid food and drink consumption either. So uncontrolled drinking of high calorie drinks might impede the patient’s weight loss or, in some cases, even cause weight gain. As any other surgical procedure gastric sleeve surgery has a risk of complications. This includes, but is not limited to infection, pneumonia, blood cloths, post operative pain, etc. Leakage is very dangerous, because the gastric juices damage the surrounding internal organs and make it easy for an infection to occur. Although the risk of complications is very low, it is higher for more obese patients. If leak occurs; we put a bariatric stent for the leak zone that is covered and starting fron distal esophagus till the first portion of duodenum. That means stomach leak is stooped by fully covered stent and stent will be taken away from the stomach between 3-6 weeks.